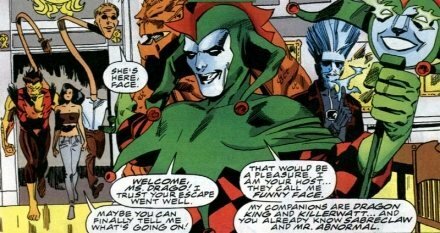 HISTORY: (Spider-Girl#25 -BTS) - Funny Face gathered together four old foes of Spider-Girl; Dragon King, Killerwatt, Mr. Abnormal and Sabreclaw. 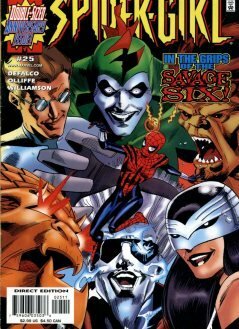 (Spider-Girl#25) - Mr. Abnormal and Sabreclaw broke Raptor out of police custody, rounding out the membership of the Savage Six. They began formulating a plan to take down Spider-Girl when Crazy Eight showed up to check in on his baby brother Funny Face. Undeterred by his brother's heckling Funny Face detailed his scheme of baiting Spider-Girl with hostages from Midville High School. Sabreclaw and Mr. Abnormal abducted students Courtney Duran and Jack Jameson while Raptor flew into the Daily Bugle to alert the press about the Savage Six's challenge to Spider-Girl. "Mayday" Parker was present at the Bugle and changed into costume. She defeated Raptor, learning that she would be forced to fight the individual members of the Savage Six in a series of predetermined locations before she could save JJ and Courtney. Spider-Girl defeated Mr. Abnormal, Sabreclaw, Dragon King and Killerwatt, winning the directions to Funny Face's headquarters. The Avengers and Fantastic Five arrived to back her up, and Funny Face freaked out when the heroes arrived at his door. Crazy Eight told Funny Face that surrender was the only logical choice, and proceeded to knock him out and hand him over to the heroes. The Avengers and members of the Fantastic Five in this story are Earth-MC2 counterparts of the mainstream Earth-616 characters. The location of Funny Face's headquarters was never revealed. It was a mansion surrounded by trees, so I'm going to guess Long Island or Westchester. Spider-Girl#25 was a homage to Amazing Spider-Man Annual #1, Spidey's first battle against the Sinister Six. Spider-Girl's battles against the individual members of the Savage Six were highlighted by full-page pin-up style panels, just like the Spider-Man Annual. other groups named "Savage" or "Six"